E-pistle 2009/05 – Fruit Flies or Peat Flies? As some of you know, in real life I am a biologist at the University of Southampton. My field of interest is largely in the realm of ecology and evolution: understanding how organisms change over time, and how these changes are driven by their environment. For a lot of my work, I use fruit flies (Drosophila melanogaster) and one area of research I have been working in is the evolution of resistance against parasites and pathogens. Like us, fruit flies have an immune system against their parasites and pathogens, and, surprisingly maybe, the bases of our and their immune system are quite similar. Now you may wonder what all this has to do with whisky? Well, in an e-mail discussion between several maniacs, Serge commented on an observation he made recently, which was that some whiskies appeared to attract more insects than others. A research project that I recently started up in collaboration with a colleague here is one which focuses on ‘immunonutrients’: specific nutrients that can be added to a diet and boost the immune system. Now one key bit of information I still haven’t given you: phenols play an important role in the immune system of fruit flies. See where I’m heading? Given that phenols are important to flies, it would be good for a fly to seek out food which contains phenols. And, as we all know, peaty drams get their peatiness from phenols ….. So I decided to set up a series of small experiments in my office, testing whether fruit flies prefer peaty whiskies over non-peaty whiskies. Experimental set-up is quite simple: get a Perspex cage, release a couple of hundred flies in the cage, give them some food in the shape of honey and then put two wee glasses in the cage, one filled with a peaty malt, one with a non-peaty malt. Each comparison will be done twice, with the position of the peaty and non-peaty malt reversed in the second run (just to avoid that flies are simply attracted to one side of the cage, of instance because there is a bit more light there). The first pair of whiskies I compared were Celp and Bunnahabhain 12 y.o. For those of you not familiar with Celp: it’s an Islay malt (of undisclosed origin, but rumoured to be a young Lagavulin or Laphroaig), bottled at 55% together with a twig of waterweed. The idea was to infuse the whisky with ‘sea weed essence’. Obviously, because of the added waterweed, it can’t be sold as ‘whisky’. For the experiment, of course I made sure to dilute the Celp down to the same alcohol % as the Bunny, to make sure flies weren’t simply choosing on the basis of alcoholic strength. Leave the glasses for one to two days and all you need to do is count the numbers of flies that drowned themselves in the two glasses. And this first experiment gave a clear result, consistent between the two runs: 68% of flies went to the glass with Celp! That’s a promising first result, but of course the flies could prefer the Celp for any number of reasons; doesn’t have to be the peatiness. In order to make a stronger case for fruit flies being attracted to the phenols, I need to repeat the experiment with several other peaty malts. If flies keep going to a peaty dram, independent of exactly which peaty dram I use, then there is a stronger case for flies being attracted to the phenols and not something else. So a few more experiments are called for! First Connemara Cask Strength versus Locke’s (again, the Connemara diluted appropriately). Like in the first experiment, a very clear and consistent result, but not as expected: 78% of flies go to the Locke’s! Maybe Irish phenols are not as good for boosting the immune system as Scottish phenols?? Back to Scotland it is then, with Glenfiddich 15 y.o. Cask Strength (appropriately diluted) being offered together with Talisker 10 y.o. And again the results are clear and consistent between runs: 80% of flies drown themselves in the Glenfiddich …. That’s two out of three experiments suggesting that flies are not attracted but actually repelled by peaty drams …. One more: Glenfiddich again, but now together with Laphroaig 10 y.o. As the Celp from the first experiment is an Islay malt, maybe there is something peculiar to Islay-derived phenols?? But no, Glenfiddich is again the preferred dram of drowning: 70% of flies. So, although the idea of flies preferring peaty malts in order to boost their immune system was a nice one, and I could already see the marketing slogans capitalising on such a finding, the experiments I ran in my office give no indication that it is actually happening; if anything, the opposite appears to be the case. But science is all about asking questions, and testing hypotheses, and that’s exactly what I did. The hypothesis that flies prefer phenols because it boosts their immune system was rejected by these experiments. 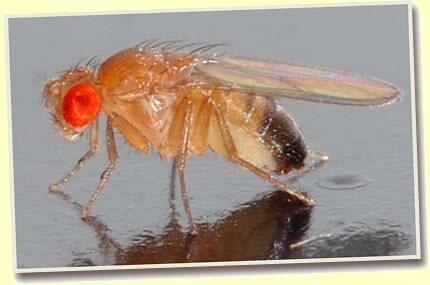 Drosophila melanogaster is clearly a fruit fly, not a peat fly. Still, the experiments did make sure my office smelled subtly of whisky for a while, and I did get my share of colleagues raising their eyebrows and students asking me questions on what I was doing with that cage of flies and glasses filled with amber liquid!